You know when you run across something and you say to yourself "Why on earth did I not come up with that?" Well it has happened to me again. Meet Project Life -- maybe you've heard of it? I certainly hadn't until I ran across some examples on Pinterest... I have now started a Pinterest board to collect all the good Project Life ideas I've found. Basically, it's slot-and-scribble scrapbooking for people like me. 2.) I'm not that creative when it comes to scrapbooking and I'm never, ever happy with the results, which is why I've abandoned most scrapbooking projects over the years. 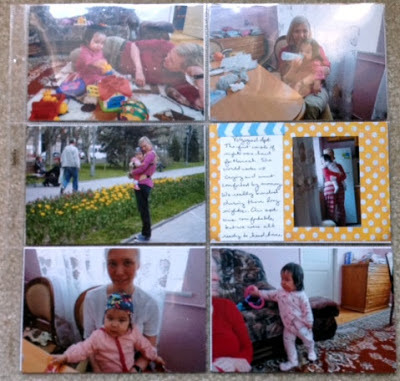 Project Life works like this: You buy the plastic sleeves, the binder, and journaling cards, you slide the cards in with some pictures, and you're good to go. While it isn't sold in Jo-Anns or Hobby Lobby, it is available on Amazon.com, and I lucked out with free shipping on mine, which was awesome. Project Life also is available in a digital version you can build, but that just seemed like more time in front of the computer, which I'm trying to avoid. Most Project Lifers seem to focus on books featuring weekly journaling spreads, which gets you 52 weeks worth of content, but I've decided to focus this first year on monthly spreads with a few extra sheets thrown in here and there. That's really the most I can handle during limited nap times and that brief window of time in the evenings -- you know, the after-she-goes-to-bed-but-before-we-go-to-bed time. I have a Project Life large envelope in the binder for each month. Throughout the month, I will put trinkets, pictures, artwork, tickets, and other memorabilia in the envelope; when I'm ready to work on a page, I pull out what I need and leave what I don't. I don't want to throw anything away, so the envelope allows me to store items that didn't fit in the binder display, and they're still available to riffle through later. I have started saving my photos with filenames ending in the month and year. I now have a set of picture_Oct12.jpg photos ready for printing. I know exactly what month I took them, so it's easier to keep track if my plans change and I can't get to my October pages for a little while. I bought a color printer. There was a sale at Best Buy, I had an online coupon, and when it was all said and done, having a $100 printer that prints wirelessly from my iPhone and iPad and scans just about anything saves me printing dollars, gas to pick them up, and/or the wait when I have them sent through the mail. It was just worth it. When I'm ready to work, there's nothing stopping me, and I can photo edit on the fly. I'm keeping it simple. There are some amazing, creative Project Lifers out there, but I had an honest conversation with myself about my time and goals. 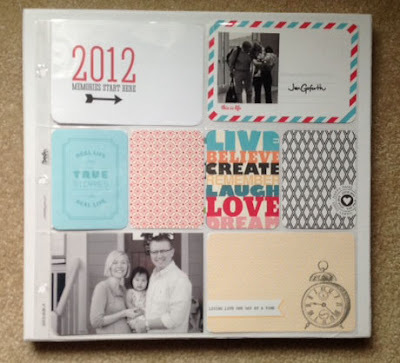 For me, ensuring that I can walk into 2013 with the 2012 Project Life album done was more important than creating embellished layouts and designs. I'm doing my best to stick to the basics and enhance things here and there. There are some really excellent scrapbooks spreads I found inspiring and amazing on my Project Life Pinterest board . I'm going to work to add more designs and journal cards... you gotta have goals right?! ?